There’s no doubt that Gmail has changed the way we consume email. It’s free, it gives most of us all the storage we’ll ever need, and it does a better job than most in weeding out spam and malware. But there’s a cost to all of this. The advertising model that makes this cost-free service possible means some of our most sensitive messages are being scanned for clues about who we are, what we care about, and what we do both online and offline. There’s also the possibility of Google either being hacked or legally compelled to turn over contents. On Wednesday, a Seattle-based startup called Helm is launching a service designed to make it easy for people to securely take control of their email and other personal data. The company provides a small custom-built server that connects to a user’s home or small-office network and sends, receives, and manages email, contacts, and calendars. Helm plans to offer photo storage and other services later. 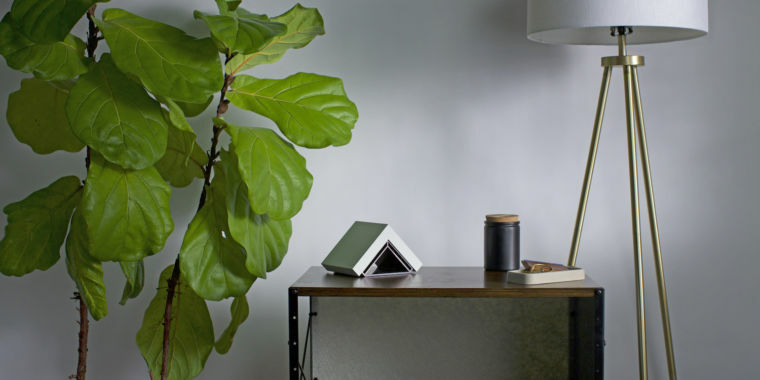 With a 120GB solid-state drive, a three-minute setup, and the ability to store encrypted disk images that can only be decrypted by customers, Helm says its service provides the ease and reliability of Gmail and its tightly coupled contacts and calendar services. The startup is betting that people will be willing to pay $500 per year to be able to host some of their most precious assets in their own home. The service takes a best-of-both-worlds approach that bridges the gap between on-premises servers and cloud-based offerings. The server looks stylish and is small enough to be tucked into a drawer or sit unnoticed on a desk. It connects to a network over Ethernet or Wi-Fi and runs all the software required to serve email and calendar entries to authorized devices. An expansion slot allows an additional five terabytes of storage. A system-on-a-chip from NXP that stores keys for full-disk encryption and other crypto functions to ensure keys are never loaded into memory, where they might be leaked. The disk encryption is designed to prevent the contents from being read without the key, even if someone gets physical possession of the device. Support for secure boot and keys that are hardwired during manufacture so the device can only run or install authorized firmware and firmware updates. The devices are manufactured in the US or Mexico to ease concerns about supply-chain weaknesses. Firmware that only communicates over an encrypted VPN tunnel. This measure prevents employees of the user’s ISP, or anyone monitoring the home or office connection, from knowing who the user is communicating with. The firmware also automatically generates TLS certificates from the free Let’s Encrypt service. Before being backed up in the cloud, messages are encrypted using a key that’s stored on the personal server and is available only to the end user. That means if the cloud server is ever hacked or the provider is legally compelled to turn over the backed up data, it can’t be decrypted without the key. Two-factor authentication that’s based on what Helm calls “proximity based security.” The tokens that generate one-time passwords can only be installed on a smartphone that has come into close physical proximity with the Helm device during pairing by someone who knows the device password. Pairing new phones, adding email accounts, or making other changes not only requires a device password but also an OTP from an already-paired phone. While the on-premises device forms the guts of the service, Helm’s best-of-both-worlds approach does borrow a few things from the cloud. Anyone who has ever run their own home email server knows how maddeningly difficult it can be. In a bid to block spam, ISPs generally close port 25. ISPs can also make it hard to use static IP addresses and configure firewalls. To get around these shortcomings, Helm runs a security gateway that’s currently hosted on Amazon. The device communicates with this gateway over a VPN, meaning employees or hackers who get access to it can’t read any of the messages passing through it. The gateway, in turn, is the server that sends and receives the email and backs up encrypted email. The idea of eliminating Google as my email provider has great appeal to me. I mostly dislike knowing that Google scans my messages, but I’m also concerned that the unimaginably vast amount of data Google hosts makes it a juicy target to just about every advanced hacking outfit on the planet. In theory, being able to run my own server would allow me and me alone to decide who can scan or view my messages. And while my device and the apps that connect to it are still vulnerable to hacking, a single box hosting only my data has considerably less return-on-investment to would-be attackers than Google servers, which the company says host more than 1 billion accounts. Helm comes with even more uncertainty for power users who may use a variety of server-based filtering rules to block spam or funnel certain types of messages into different folders. No doubt, the prospect of people paying $500 per year and of Helm delivering the same reliability and security Gmail has for more than a decade is going to be tough. But the company is betting there’s pent up demand for a service that allows people to take control of their email, contacts, and calendaring. The bet is by no means a sure thing, but, at the very least, it’s a noble experiment that I hope one day will allow me to sever my reliance on Gmail.